The 10th edition of the ERCIS Launch Pad took place on December 6, 2017. The finale of this digital ideas competition with seven participating startups and startup intentions lured more than 150 people to the auditorium at the Leonardo Campus of the University of Münster, among them many businessman, entrepreneurs, investors, scientists, and students. The seven pitches in front of audience and expert jury were the focal point of the event. 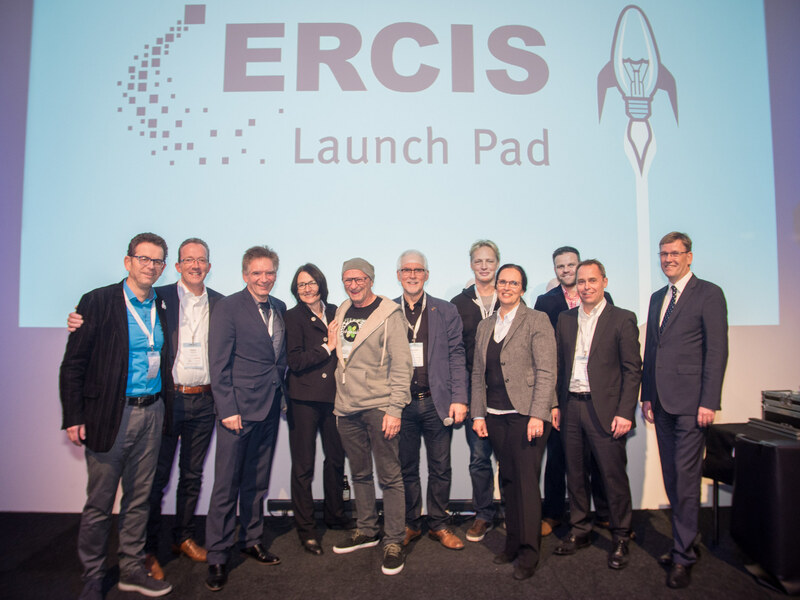 Afterwards, the award ceremony was embedded into the ERCIS Launch Pad Party at the nearby M44 Meeting Center in Münster’s Technology Park, where non-monetary as well as monetary prizes in the amount of 10,000 € were distributed among the teams. eduSense contributed the first pitch. The team develops products and services offered “digital education from one source.” The innovation centers around the senseBox, a kit based on low-cost microcontrollers and sensors for building measurement stations as well as an openSenseMap for publishing measuring results. For this nice concept, the team was awarded the PayPal special price. Young escamed startup could convince the panel with an app offering personalized nutrition therapy for people with high blood pressure. The founders from Dortmund and Münster secured the Münsterland Mittelstandspreis which came with a 2,000 € check. Free-D Printing, created by founders from the University of Bochum, presented a novel approach to 3D printing which drove home the 2,000 € award for the best scientific foundation. The final pitch was made by StriveCDN, a startup trying to optimize and cheaply provide live video streams based on their high-tech B2B software. One of the founders gave a lively presentation which was able to win over the audience and their price of 1,000 €. The overall winner of the evening turned out to be the team of Refined Laser Systems from the Physics Department of the University of Münster. WWU Rector Prof. Johannes Wessels handed over the price for the best overall concept, endowed with 5,000 €. The patented solution turns lasers into digital intelligent systems for modern microscopy, thereby opening novel perspectives for a clinical treatment of tumors via deep learning.